There's something for everyone in this anthology. You could be forgiven for wondering whether non-writers would appreciate the humour behind the stories, but it doesn't matter because in each and every one of the stories the reader can identify with the characters. What can I say? I loved this book. At the start I wasn't so sure, then I got a couple chapters into it and I had been won completely over, I couldn't wait to see what the next author did in this delightful, funny world. Authors need inspiration, muses provide that inspiration, whispering in ears, yelling at the top of their voices at the most inconvenient of times sometimes, but they are there. What happens when a male romance author suddenly can see his female muse? Find out in @MuseD by J. Morgan. 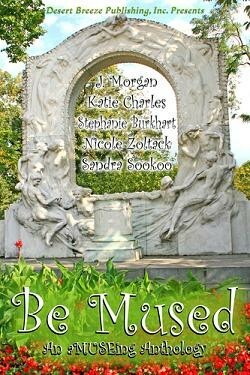 At a Muse convention an unknown young muse meets the widely known Trevor Black of the muse World, and what happens will keep you laughing as you read Katie Chailes's Inspiration Lost and Found. In Matchmaking A-Muse-ment by Stephanie Burkhart, two muses go on vaction while their authors deal with edits and fall in love. Now they have to get their authors together so they can get married. Melphene and Thalia Sittin' In a Tree by Nicole Zoltack explores an author of Paranormal mysteries who gets writer's block and takes a seminar taught by an author who has a stalker. Not A-Mused by Sandra Sookoo explores two muses that have been fighting their love for centuries as their writers meet at a class and fall in love. Again I can't say how much I loved these stories. They were fun and cute and, a couple of them, thought provoking. The first two by Ms. Morgan and Ms. Chailes share a couple of the same characters, and they continue each other almost. Ms. Burkhart took us to a different type of muse on a slightly different plane and had a lot of fun in Germany with her pixie muses. Ms. Zoltack made us stop and think about stalkers and safety as we went back to the MUSEum bar from the first two. And in Not A-Mused, Ms. Sookoo wonders how far an immortal muse will go to prove his love for a feisty conterpart whom he has hurt in the past. I was so caught up in these stories I lost sleep finishing them up. It is a must get and must read. The comedy in the stories enhances the story line and the muses keep you guessing. I rate this a full 5 wings and remember authors, your muses have a life of their own.